MECHELEN (BE) - From 1995 to 2005, both OECD (Organization for Economic Cooperation and Development) Europe and the United States experienced relatively flat natural gas production. Natural gas consumption rose steadily in Europe over that period, but it was flat in the United States as rising use of natural gas for power generation was offset by declining use of gas in industry. 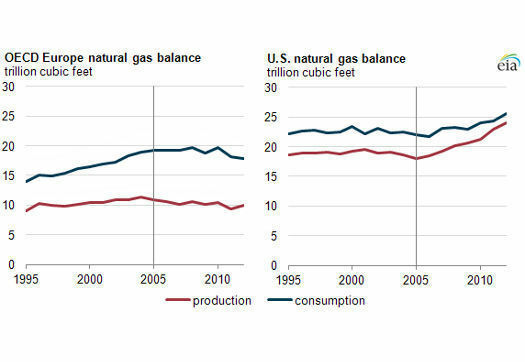 Since 2005, significant production growth has outpaced rising consumption in the United States, reducing net imports of natural gas by 58% between 2005 and 2012. Production and consumption in OECD Europe have both fallen moderately since 2005, reducing Europe's net imports by only 6% between 2005 and 2012. Between 1995 and 2005, OECD Europe natural gas consumption growth outpaced production growth by 2% per year. These trends pushed net imports to 8.2 trillion cubic feet (Tcf) in 2005 and to a peak of 8.9 Tcf in 2008. Since 2005, total natural gas production in OECD Europe has decreased slightly. The United Kingdom has been the largest contributor to the overall decline. Production in the United Kingdom dropped to 1.4 Tcf in 2012, to less than half the level of production in 2005. Even though Norwegian production increased over the same period, its production increases were not sufficient to offset production decreases in the United Kingdom and other countries in OECD Europe. From 2005 to 2012, OECD Europe consumption decreased by 7% to 17.9 Tcf. Natural gas consumption declines in the United Kingdom, Germany, and Italy accounted for two-thirds of the total decline. Industrial consumption has been steadily declining in Europe since 2000. Previously, strong growth in natural gas use for power generation had more than offset declining industrial consumption, but more recently natural gas use for power generation has been either unchanged or declining. Natural gas production increases in Wyoming, Colorado, Pennsylvania, and Oklahoma accounted for most of the U.S. natural gas production gain over this period. Even though natural gas consumption has not grown as fast as production, it still grew by 16% over this period, to 25.5 Tcf in 2012. This growth was mainly driven by consumption for electric power generation. As a result of robust production growth in the United States, U.S. net imports in 2012 fell to the lowest level since 1990. 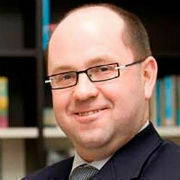 Constanze Schmitz holds the position of editor of Processing & Control News Europe (PCN Europe) since 2006. She is responsible for the editorial content of the print and digital issues of the magazine as well as the website pcne.eu. Before working as an editor for Thomas Industrial Media, Constanze Schmitz worked for its sister company Thomas International Publishing Company as editor for the industrial buying guide Thomas Register.